How can you close down veins? Don’t you need them?! It’s a good question, because it sounds so counter-intuitive to close down veins that are needed to return the blood back to the heart. Those veins are obviously needed and are still getting some blood back to the heart even if they are not functioning 100% correctly they are still doing some work. I think that everyone would agree that anytime you are talking about closing down veins and stopping blood flow through them it makes you question if that is really a good idea. I mean the last thing anybody wants to do is to create problems. So let’s explore this question and see how we CAN close veins down and actually improve circulation in your legs by doing so. The first thing that we need to understand is the venous system in the lower legs. Veins are responsible for returning blood from the leg back to the heart. It is the arteries that take blood flow from the heart down to the legs. And in the venous system there are Deep veins and Superficial veins. 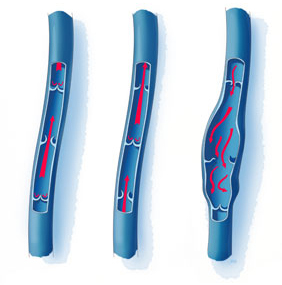 Veins work by one-way valves. These valves allow blood up and out but then close to prevent it from retuning backwards through the vein. In varicose veins these valves have stopped functioning. The deep system is the major carrier of the blood flow back to the heart. All deep veins are underneath the muscles running close the bones. From the knee up it is really just one vein that does all the work. In fact the deep system carries about 90% of all the blood form the legs back to the heart. That is impressive. The remaining 10% goes back through the superficial system.